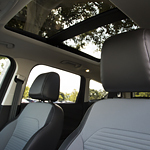 Special features like the Panoramic Vista Roof make it enjoyable to drive the Escape. This Vista Roof is available on all the models, and it comes with a fixed rear skylight and a forward panel that can either tilt up or slide open for fresh air. When you take the Escape for a spin, you'll appreciate the set up of the steering wheel. It has an ergonomic shape for comfort, and it can include a heating element to keep your hands warm on a chilly day.